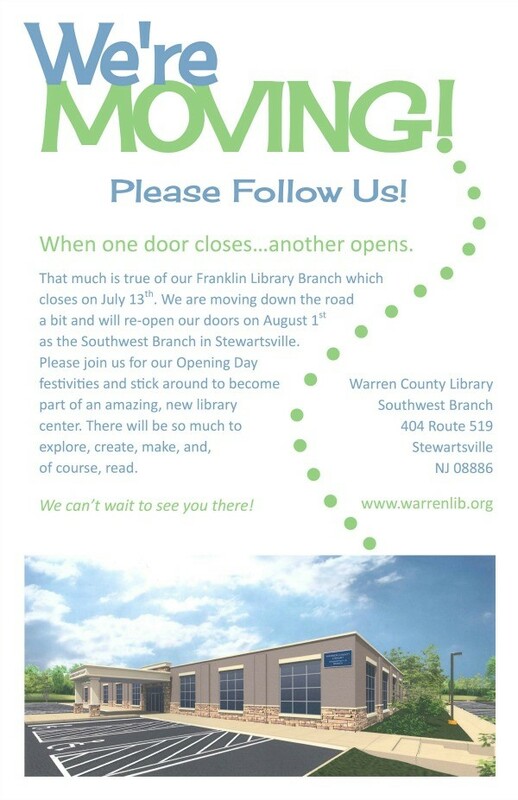 On Friday, July 13th the Franklin Branch will close in preparation for their move to their new location in Greenwich Township. Our library will reopen August 1st in a wonderful new building and with a new name: Southwest Branch. After July 13th, members can pick up items they reserved at our Headquarters Branch in Belvidere. If you are not able to visit the Headquarters Branch, we will transfer the items to the Southwest Branch when it opens and hold the items for one week. While we are closed, we invite you to use any of our other branches for the summer reading program and other library services. Library materials can be returned to any branch and the exterior book return at the Franklin location. If you have not been able to pick up items you requested prior to our closing, they will be available at the Headquarters Branch and later transferred to the Southwest Branch when it opens. Residents in the Southern Townships who do not have a Warren County Library card can apply for a library card at any of our branches. Click here to access our online registration to verify whether you qualify for a free Warren County Library card. Warren County Library cards can be used at any of our locations. Items may be requested from any branch and delivered to the branch of your choice. For more information about library membership or services visit our website or any of our branches.